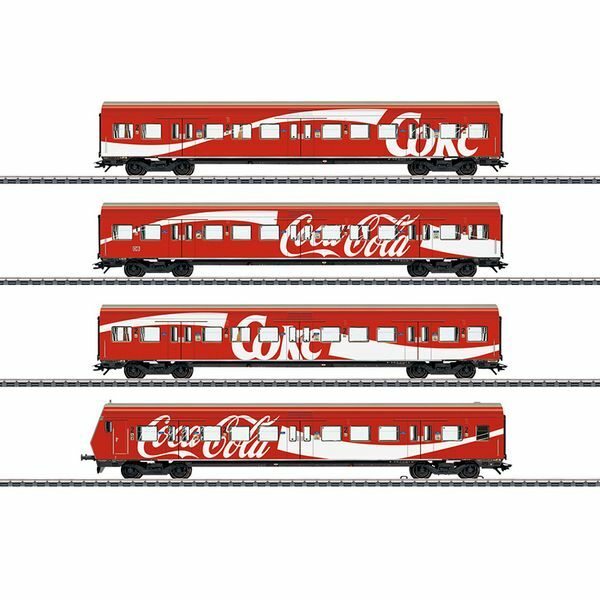 Prototype: Four German Railroad, Inc. (DB AG) S-Bahn cars with Coca Cola® advertising. 1 type ABx 791 car, 1st/2nd class, 2 type Bx 794.1 cars, 2nd class, 1 type Bxf 796.1 car, 2nd class with a cab. The cars look as they did around 1995. Model: The cab control car has a lighted destination board at the end. When operated control car first, triple headlights shine on the cab control car. When operated control car last, red marker lights shine on the cab control car. The headlight / marker light changeover will work in both analog and digital operation. The 73150 light kit can be installed in the cars. Total length over the buffers about 99 cm / 39". DC wheel set E700580. Red marker lights / white headlights changeover. An electric locomotive to go with this car set can be found in the Märklin H0 assortment under item number 37313.